We’ll provide some insights and review some of our DFS value players for week 8. Drew Brees (NO) – Salaries: DraftKings (DK) – 5600, FanDuel (FD) – 8600. Brees’ upcoming salary ranks him 15th/3rd on DK/FD, respectively for the position, making him a much better relative value on DK. Brees posted a 22/30, 212, 2:0 line and 4-3-0 on the ground at Baltimore last week. Brees’ fantasy points of 16.78 ranked him 17th on both DK/FD. The betting line with the Vikings lists the game total at 52 points as a pick ‘em in Minnesota on Sunday night. Each teams’ implied total is currently at 26 points. The Vikings rank 24th against QBs in fantasy points allowed and 19th in DVOA against the pass. The Vikings also rank 16th in pass yards allowed with 256.1/gm, and 14th in points allowed with 23.6/gm. The Saints rank 5th in pass yards per game and 2nd in points per game with 301.5 and 34, respectively. Sam Darnold put up a 17/42, 206, 1:3 line and 6-18-1 on the ground with a lost fumble against the Vikings last week. Among active starters, Brees’ 25.3 fantasy points/gm on DK ranks 5th for the position. Last season, in the NFC divisional round, Brees put up a 25/40, 294, 3:2 line in Minnesota. Brees’ salary dropped $100 this week on DK, despite getting a better matchup in Minnesota as opposed to Baltimore’s stronger defense. This is a little weird. His salary remained unchanged on FD. The Vikings’ defensive strength is against the run, where they rank 5th in rushing yards allowed with 89.7/gm, 9th in DVOA against the run, and 9th in fantasy points allowed to RBs. The Vikings rank 6th in plays/gm with 67.3 and the Saints rank 10th with 66.2/gm, so ample opportunities should await both sides. Of note, CB Xavier Rhodes’ (ankle) status is currently unknown. Check his practice updates by weeks end. The matchup and DK price sets up very nicely for Brees this week. Kirk Cousins (MIN) – Salaries: DraftKings (DK) – 5900, FanDuel (FD) – 8300. Cousins’ upcoming salary ranks him 11th/7th on DK/FD, respectively for the position. Cousins posted a 25/40, 241, 2:0 line at the New York Jets last week. Cousins’ fantasy points of 17.54 ranked him 16th on both DK/FD for the position. The Saints’ defense ranks 31st against QBs and last against WRs in fantasy points allowed, and 30th in DVOA against the pass. The Saints also rank 28th in pass yards allowed per game with 293.7 and 27th in points allowed with 27.2/gm. Joe Flacco put up a 23/39, 279, 2:0 line against New Orleans last week. Similar to the Vikings, the Saints’ defensive strength is against the run, where they rank 1st in rushing yards allowed with 72.3/gm, 2nd in DVOA against the run, and 5th in fantasy points allowed to RBs. Cousins’ salary increased $300 this week on FD. However, his salary dropped $400 on DK despite getting the nuts draw at home, as opposed to the Jets last week. This is very weird. Jameis Winston (TB) – Salaries: DraftKings (DK) – 6000, FanDuel (FD) – 7800. 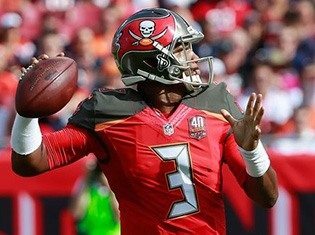 Winston’s upcoming salary ranks him 8th/10th on DK/FD, respectively for the position. Winston posted a 32/52, 365, 0:2 line and 10-55-1 on the ground with a lost fumble against the Browns last week. Winston’s fantasy points of 26.1/22.1 ranked him 3rd/6th on DK/FD, respectively for the position. Winston’s price per point efficiency ranked him 6th/7th on DK/FD, respectively. The betting line with the Bengals lists the game total at 54 points (3rd highest on the board) with the Bucs as +4.5 point road dogs. Bucs’ implied team total is currently at 24.75 points and the Bengals are currently at 29.25 points. The Bengals rank 28th against QBs in fantasy points allowed and 24th in DVOA against the pass. The Bengals also rank 29th in pass yards allowed with 300.7/gm, and 28th in points allowed with 29/gm. The Bucs rank 1st in pass yards per game and 8th in points per game with 364 and 27.8, respectively. Pat Mahomes put up a 28/39, 358, 4:1 line and 4-45-0 on the ground against the Bengals last week. Albeit on a small sample size, in Winston’s two starts this season, he’s averaging 30.9 fantasy points (DK), which would rank him 1st. In this same frame, he’s averaged 42 rush yards/gm, which would put him only behind Cam Newton’s league leading 42.83/gm. OC Todd Monken has done a solid job with scheming for the pass game and there’s no reason this shouldn’t continue. Winston’s salary remain unchanged this week on FD, however, his priced dropped $300 on DK. Winston brings a high floor/high ceiling potential play with a great matchup. Three starting Bengals defenders have been ruled out: SCB Darqueze Dennard (shoulder), LB Nick Vigil (knee), and LB Vontaze Burfict (hip). The line on the Bucs dropped a point to +3.5 and the total bumped up a half a point. Jalen Richard (OAK) – Salaries: DraftKings (DK) – 4200, FanDuel (FD) – 5700. Richard’s upcoming salary ranks him 35th/39th on DK/FD, respectively. Richard posted a 2-3-0 rush line and 7-48-0 on 8 targets (all team highs) against Seattle in week 6. The betting line with the Colts has the game total at 50 points with the Raiders as +3 point home dogs. The Raiders’ implied team total is currently at 23. 5 points and the Colts are currently at 26.5 points. The Raiders are coming off their bye. The Colts rank 17th against RBs in fantasy points allowed and 15th in DVOA against RBs in the pass. The Bills’ RBs combined for a 22-135-0 line and 8-42-0 on 12 targets at Indianapolis last week. With Marshawn Lynch (groin) now on IR, Gruden off-season free agent addition Doug Martin is expected to see the two-down role. Martin hasn’t been effective in years, and this week shouldn’t be any different. If the implied negative script holds, that will be Richard’s time. Richard’s 37 targets and 32 receptions both rank 2nd on the team behind only Jared Cook. And that was when Amari Cooper was on the team. Cooper’s 13.3% target share and Lynch’s 8.6% target share now become available. Derek Carr’s avg. completed air yards of 4.4 and his avg. intended air yards of 6 are both league lows among active starters, which is exactly in Richard’s wheelhouse. Carr’s 38.8 attempts/gm ranks 8th most in the league. It wouldn’t be surprising if Richard ends up being Carr’s #1 receiving option again this week. Marlon Mack (IND) – Salaries: DraftKings (DK) – 5400, FanDuel (FD) – 6700. Mack’s upcoming salary ranks him 16th/18th on DK/FD, respectively. Mack posted a 19-126-1 rush line and 2-33-1 on 3 targets against the Bills last week. Mack’s fantasy points of 34.9/30.9 ranked him 2nd on both DK/FD for the position. Mack’s price per point efficiency ranked him 1st on both DK/FD. The Raiders rank 21st against RBs in fantasy points allowed, 14th in DVOA against the run, and 27th in rushing yards allowed with 131.8/gm. The Seahawks’ RBs combined for a 29-123-0 rush line and 3-32-0 on 5 targets against Oakland in week 6. Mack has averaged 6.9 YPC the past two games. With the implied positive game script and appearing healthy from his hamstring issues, Mack should reasonably produce against a barely there Raiders defense. Mack (ankle) put in a full Friday practice, but is listed as questionable. TE Jack Doyle has been removed from the injury report. Andrew Luck now has all his skill position weapons available for the first time this season. Adrian Peterson (WAS) – Salaries: DraftKings (DK) – 4900, FanDuel (FD) – 7000. Peterson’s upcoming salary ranks him 24th/15th on DK/FD, respectively. Peterson posted a 24-99-0 rush line and 1-8-0 on 2 targets against the Cowboys last week. Peterson’s fantasy points of 11.7/11.2 ranked him 26th/21st on DK/FD, respectively for the position. The betting line with the Giants has the game total at 42.5 points with the Redskins as -1 point road favorites. The Redskins’ implied team total is currently at 21.75 points and the Giants are currently at 20.75 points. The Giants rank 19th against RBs in fantasy points allowed, 22nd in DVOA against the run, and 20th in rushing yards allowed with 113.9/gm. The Falcons’ RBs combined for an 18-66-1 rush line and 6-68-0 on 6 targets against the Giants last week. Peterson catches a big break as NT “Snacks” Harrison has just been traded to Detroit. With CB Eli Apple previously traded to New Orleans, the Giants are now in tank-mode. The Giants run-defense wasn’t good to begin with but now takes a big hit with the loss of Snacks. If the implied positive script holds, Peterson should be in line for 20+ touches in a much friendlier matchup. ILB Alec Ogletree (hamstring) is out. Not a big loss for the Giants, but if his backup is supposedly worse, ugh. The current line is now even and the total bumped up 1 point. Tre’Quan Smith (NO) – Salaries: DraftKings (DK) – 4000, FanDuel (FD) – 5100. Smith’s upcoming salary ranks him 61st/64th on DK/FD, respectively for the position. Smith posted a 3-44-0 line on 6 targets at Baltimore last week. Minnesota’s defense ranks 5th against WRs in fantasy points allowed and 19th in DVOA against the pass. Jets WRs combined for a 6-74-0 line on 18 targets against Minnesota last week. Now that Ted Ginn (knee) had been placed on IR, Smith is the clear-cut WR2. Smith’s 73% snap share and targets ranked 2nd on the team last week for WRs. Cam Meredith’s 25% ranked a distant 3rd and didn’t receive a target. This game has the potential for a shootout, and if so, Smith should be reasonably involved. Geronimo Allison (GB) – Salaries: DraftKings (DK) – 5000, FanDuel (FD) – 5700. Allison’s upcoming salary ranks him 34th/41st on DK/FD, respectively for the position. Randall Cobb (GB) – Salaries: DraftKings (DK) – 4900, FanDuel (FD) – 6100. Cobb’s upcoming salary ranks him 36th on both DK/FD for the position. The betting line with the Rams has the game total at 56.5 points (highest on the board) with the Packers as +9.5 point road dogs. The Packers’ implied team total is currently at 23. 5 points and the Rams are currently at 33 points. The Rams rank 7th against WRs in fantasy points allowed, 7th in DVOA against the pass, and 9th in passing yards allowed with 227.3/gm. However, for some context on these rankings, the Rams have faced CJ Beathard, Case Keenum, Russell Wilson, Sam Bradford, and Derek Carr. Not exactly the murderer’s row of passing competition. Kirk Cousins tore them up in week 4. Cobb and Allison both had hamstring issues, but it’s possible either/both may be ready to go following their bye. Any on-field weapon of Aaron Rodgers is a potentially dangerous one. If they’re playing, either is good to go. Allison has been removed from the injury report but Cobb is listed as questionable. C.J. 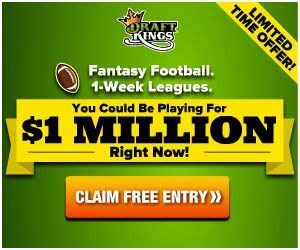 Uzomah (CIN) – Salaries: DraftKings (DK) – 3500, FanDuel (FD) – 5400. Uzomah’s upcoming salary ranks him 17th/15th on DK/FD, respectively for the position. Uzomah posted a 2-13-1 line on 2 targets at Kansas City last week. Uzomah’s fantasy points of 9.3/8.3 ranked him 11th on both DK/FD for the position. The Bucs’ defense ranks last against TEs in fantasy points allowed and 30th in DVOA against TEs. David Njoku put up a 4-52-1 line on 6 targets at Tampa Bay last week. Uzomah is the only Bengal TE to see the field and his 97% snap rate ranked 2nd in the league for TEs last week. Although Uzomah gets all the snaps, he does not get a lot of targets. He does, however, get the best TE matchup you could ask for. Ben Watson (NO) – Salaries: DraftKings (DK) – 3100, FanDuel (FD) – 5400. Watson’s upcoming salary ranks him 18th/15th on DK/FD, respectively for the position. Watson posted a 6-43-1 line on 6 targets at Baltimore last week. Watson’s fantasy points of 16.3/13.3 ranked him 5th on both DK/FD for the position. Watson’s price per point efficiency ranked him 5th/6th on DK/FD, respectively. The Vikings’ defense ranks 26th against TEs in fantasy points allowed and 27th in DVOA against TEs. Jets TEs put up a combined 5-37-1 line on 9 targets against the Vikings last week. Watson gets the best position group matchup on the Saints. Surely Payton/Brees realize this, right?